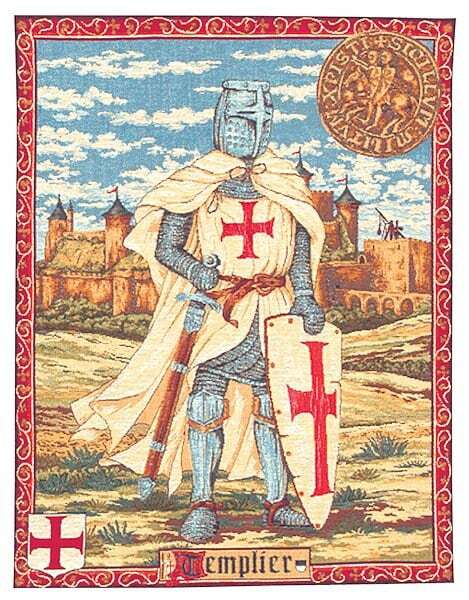 This Museum Collection wall tapestry shows the a Knights Templar. The Poor Fellow-Soldiers of Christ and of the Temple of Solomon (Latin: Pauperes commilitones Christi Templique Salomonici), commonly known as the Knights Templar, the Order of Solomon's Temple (French: Ordre du Temple or Templiers) or simply as Templars, were among the most wealthy and powerful of the Western Christian military orders and were prominent actors in Christian finance. The organization existed for nearly two centuries during the Middle Ages. Officially endorsed by the Roman Catholic Church around 1129, the Order became a favoured charity throughout Christendom and grew rapidly in membership and power. Templar knights, in their distinctive white mantles with a red cross, were among the most skilled fighting units of the Crusades. Non-combatant members of the Order managed a large economic infrastructure throughout Christendom,innovating financial techniques that were an early form of banking,and building fortifications across Europe and the Holy Land. Size is 48x62 cms (19'x27'). Arrived a week ago, way ahead of schedule, looks great.